In what will not be the most exciting Monday Night game of the season, the Dallas Cowboys travel to the desert to take on the Arizona Cardinals. Despite getting a win, the Cardinals have been one of the bigger disappoints so far this year. And without David Johnson the team has looked completely lost of offense. The Cowboys were completely shut down by a tough Denver defense but should rebound and provide more running space for Ezekiel Elliott. Expect a grinding, closer than expected game with the Cowboys superior offensive line making the difference. Dak Prescott has already cleared two of the biggest hurdles of the season with games against the Giants and Broncos. And he did so, with relative fantasy success, although it should be noted that throwing the ball an average of 45 times a game will not be the norm. Arizona's secondary presents another tough challenge, and limits Prescott's upside, but there are better days ahead for the QB and he represents an acceptable floor for a QB1. It's worth mentioning that Prescott has a minor ankle injury but Jerry Jones has already confirmed he is good to go for week 3. 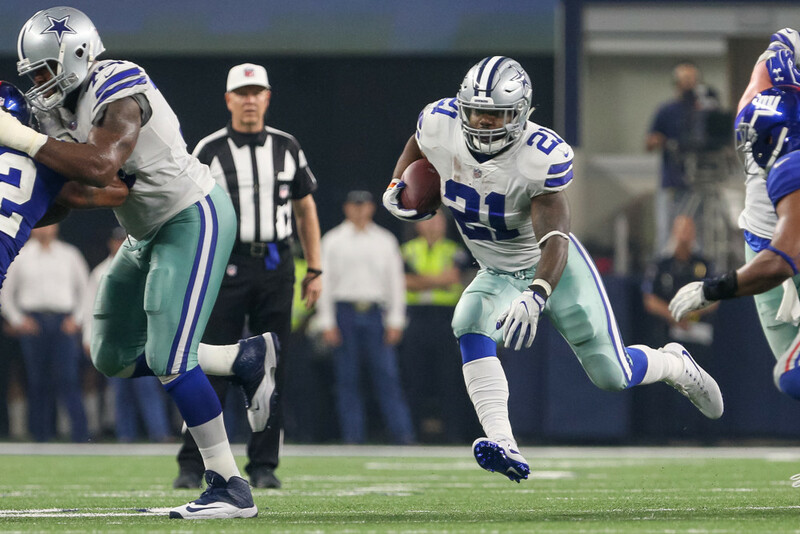 Coming off his worst week as a pro, Ezekiel Elliott will look to rebound in week 3 against Arizona. The Cardinals have shown the ability to stop the run so far this season, but that was against the Lions and Colts. The Cowboys should be able to create holes and a closer game will afford Elliott more opportunities. Start him with confidence but keep an eye on his legal battle. Dez Bryant had another tough week against the vaunted Broncos "No Fly Zone," but still managed to catch 7 passses for 59 yards and a score thanks to a robust 16 targets. He faces a similarly difficult test against Patrick Peterson in week 3, and remains more of a WR2 than a WR1. Four catches for 33 yards. Rinse and repeat. Cole Beasley will remain a seven point floor flex option in PPR for most of the season. Outside of PPR he is barely rosterable. Say hello to your 35 year old number one fantasy tight end, Jason Witten! In a year where tight ends are dropping like flies, Witten presents a high floor, safe option for fantasy players. Jack Doyle just had a huge game against Arizona last week, so roll with Witten again. Another rough outing against one of the worst teams in the league means Carson Palmer shouldn't be anywhere near your starting lineup in week 3. Considering how bad he has been, it's questionable if he should even be holding a roster spot on your team at this point. Garbage time may afford him some points, but look elsewhere for a starting QB until he shows he can manage the offense. With Carson Palmer's steep decline, Larry Fitzgerald is becoming less and less a fantasy factor. Expected to have a huge day against the woeful Colts, Fitzgerald managed only three catches for 21 yards. He is a risky flex option until the Cardinals figure out how to score. Inactive for the game against the Colts, Bruce Arians is already on the record stating that he doesn't think John Brown will be able to play week three against the Cowboys. He is worth holding onto for the upside, but is not an option this week. With John Brown out, it was J.J. Nelson who has capitalized on his absence, scoring two touchdowns in two games and catching five of his seven targets for 120 yards against the Colts. The Cardinals' offense is a tire fire so he is a risky play but presents a high ceiling flex option if you are desperate. This is a situation to avoid at all costs. It's like the New England backfield minus all of the yards and touchdowns. Kerwynn Williams was a popular waiver pick up but did nothing with his snaps or carries last week. Chris Johnson looked the most effective on the ground but has little upside. And Andre Ellington actually played the most snaps, but is more of a passing down option. Ignore all three.